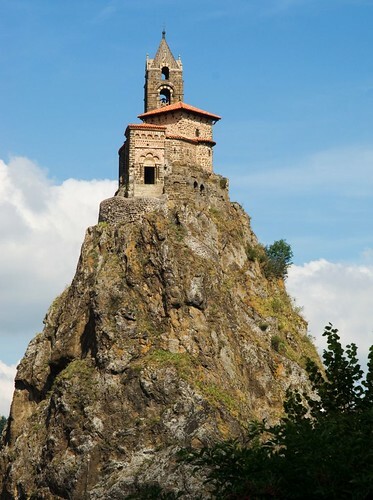 Perched atop 85 metres (280 ft) high pointed rocky peak of a volcanic plug in the French commune of Aiguilhe (meaning needle) near Le Puy-en-Velay is one of the architectural gems of France - a small chapel - The Chapel of Saint Michel d'Aiguilhe. The top of the peak is about 34 metres by 13 metres only. The volcanic plug is estimated to be more than a million years old. Built in 962, the chapel is reached by steep winding stairs having 268 steps carved into the rock. There is barely any free space at the top and its construction is a remarkable piece of workmanship. 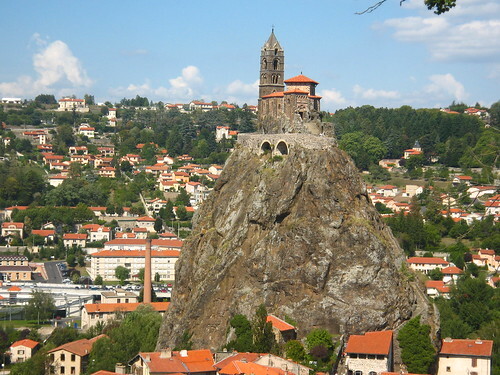 It was built to celebrate the return of Bishop of Le Puy from a pilgrimage of St. James. A Roman temple dedicated to Mercury reportedly existed at the rocky peak prior to construction of the chapel. Chapel's portal is adorned with figures of Christ, Virgin Mary, Archangel St. Michael, St. John and St. Peter carved in stone and the interior is decorated with many frescoes.